Learn how to treat your acute illnesses yourself with homeopathy! Homeopathy is an effective, non-toxic and inexpensive way to solve acute and chronic problems and maintain one's health. It activates and makes use of the natural, inborn healing capacities evolution has stored in your body during the course of countless milennia. With the number of natural and human-caused disasters increasing dramatically these days, as are dire predictions for the future, you might consider learning how to treat illness yourself when medicines and hospitals are no longer available and you or a family member becomes acutely ill, or, for example, has contracted an infection—a deadly problem without antibiotics. With homeopathy, you can make your own medicines and treat yourself, your family and pets. This book will show you how. You and your family can become independent of medical assistance for most acute illnesses by learning the basic, simple methods presented in this book of how to use homeopathic remedies. Treat acute illnesses yourself at hardly any cost, without needing costly, toxic and side-effect producing chemical drugs, while improving the general health level and life quality of your loved ones. Nip the flu in the bud with just one pill as soon as you notice flu symptoms. You are on your way home on a warm day after a long day’s work in an air-conditioned office and notice a sore throat coming on, and that you feel a bit out of sorts. Realizing that a cold is building up, you reach into your homeopathic remedy kit and take an Aconitum 200 C pill. By the time you arrive home, the budding cold is gone. Recover quickly from injuries, operations, childbirth and dental work. After a tooth extraction at the dentist’s, your wife comes home complaining of pain. Naturally she has refused an antibiotic from the dentist, knowing that you will deal with the problem using homeopathic means. She has already taken Arnica 200C from her remedy kit after leaving the dentist’s office. You give her another suitable homeopathic remedy, such as Staphysagria, and the next day there is hardly any pain at all. Cure fear of flying before you travel. You are at the airport going on a business trip, when you meet a friend. She tells you she is afraid of flying and quite anxious regarding her pending flight. You offer to help her with a homeopathic pill, which you tell her contains no chemicals—only information that will stimulate the body to cure itself. She is willing to give it a try. Some weeks later you see her again on the street and she thanks you profusely, as her fear of flying had vanished like magic before boarding the plane. Greatly speed up your child’s recovery from childhood illnesses such as the measles. Your young son tells you that his friend and others at the school have come down with the measles. You implement the homeopathic immunization program of giving Pulsatilla 200C once a week while the epidemic lasts, and your son avoids the measles and acquires immunity to the disease. Help your dog or cat, or other pet, recover rapidly from injuries, bites and other traumas. You bring a young cat into the family as a companion for an older cat Toby you have. However, Toby does not receive the newcomer very well. He hisses and strikes out at your new cat Sweetie. Not a very pleasant situation, but you know how to deal with it. You add the homeopathic remedy Hyoscyamus 1M to Toby’s drinking bowl one day and two days later on arriving home, to your surprise you see the two cats cuddled up together on the bed, the best of friends. In extreme survival situations you will be able to treat yourself and your loved ones by making your own homeopathic remedies. Suppose you and your family find yourselves isolated, civilization around you has collapsed, perhaps you are out in the wild to escape deteriorated and hostile city conditions. Your son has cut himself on a rusty metal part while looking for food and he is running a fever. You have learned how to make the correct homeopathic antibiotic remedy for this using a proven method taught in this book. Rather than passing on to another plane, your son recovers completely in some days. Your wife is extremely grateful. Bird flu, or any other lethal flu, strikes and there are thousands of sick and dying people in your town while waiting for the medical authorities to produce a sufficient quantity of a possibly effective vaccine in six months’ time. With the information contained in this book you prepare a homeopathic remedy in your kitchen to treat your sick daughter and neighbors, some of which are in very bad shape. They all recover after a very difficult bout with the bird flu, but they are alive. There you are. Considering the times we are living in, purchasing this book will be a prudent investment that can save your life as well as the lives of your family members, friends and pets. It will certainly improve their health and life quality. This is cutting-edge technology, ahead of the current level at which medicine is practiced. This book contains information never presented in this concise and practical manner, including advances in the creation and transmission of homeopathic remedies not mentioned in standard literature on homeopathy. A new and simpler approach to treating illness awaits your discovery. Homeopathy has been around for more than 200 years and has a proven track record as practiced by medical doctors and laymen alike, with an enviable track record of cures in epidemics. You can join the ranks of vanguard practitioners of the medicine of the future. 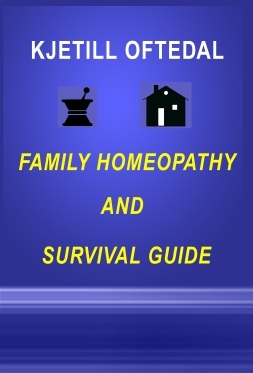 Purchase Family Homeopathy and Survival Guide by clicking on the button below. You, your family and pets will benefit from it.